Do you think that children deserve the best possible care and products we can afford? One of the most important things in the healthy development of your child is a good sleep. Proper bedding systems should help your baby to sleep well, and provide necessary support for their spine and neck. If you are a parent looking for the ultimate crib mattress for your baby or toddler, choosing a good one is not an easy task. According to American Academy of Pediatrics many parents put their babies in unsafe sleeping conditions. If you're in a hurry, check out Safety 1st Heavenly Dreams White: It's made with a waterproof cover and high-density memory foam which provides comfort for the child and easier maintenance and cleaning for you. There is no right or wrong size. However, there are some regulations. The minimum size proposed by the government are in a range between 27 5/8″ to 28 5/8″ of width and 51 3/4″ to 53″ in length. The minimum size should be 27 1/4” x 51 5/8” and the bedding shouldn't be thicker than 6 inches. The main rule is to have it fit the crib snug or moderately snug. The depth differs between 5 to 6 inches for coil crib type and 4 to 6 inches for foam-based products. Generally, if the gap is more than two fingers, the mattress is too small. A well-designed mattress should not only make your baby’s sleep more comfortable but should also give support for healthy spine development. The material is one of the most important aspects you should consider. Try to find a long-term, comfortable bed since your child will probably sleep in a crib until the age of three. A mutual opinion on whether a foam or innerspring type is better for the baby doesn't exist so you should carefully research before you buy. 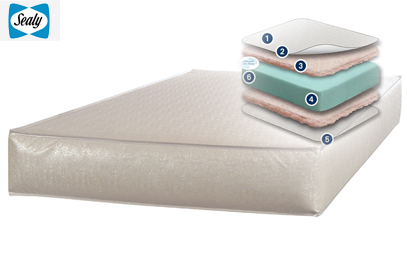 Make sure to read our complete overview of memory foam mattresses and how it works. Most of the experts are of the opinion that it’s better to have a firm crib mattress over a soft mattress. According to the Center for Disease Control and Prevention, the main death cause for infants in the United States of America is the SIDS – Sudden infant death syndrome. This syndrome is caused by suffocation hazards which are a consequence of a soft sleeping surface. The bedding should snap back when you press it on the center and the thresholds. It shouldn't conform to the baby’s head shape. The bed should be resilient enough to regain its shape quickly after applying hand pressure on it. There are however various types which have two level of firmness foam. One soft for the toddlers and a firm one for infants. As far as infants are concerned, it’s safer to go with the firm rather than soft. It might be a good idea to buy a waterproof mattress. A good indicator that it's water resistant is a double or triple ticking bolstered with nylon. This kind of content will also show high resistance to being teared up or soaking other solids or liquids. Most of the products have covers made out of cotton and you might want to buy waterproof covers instead. You should also take notice of the airflow in and out. It should have venting holes which will release the odor from leaking diapers. 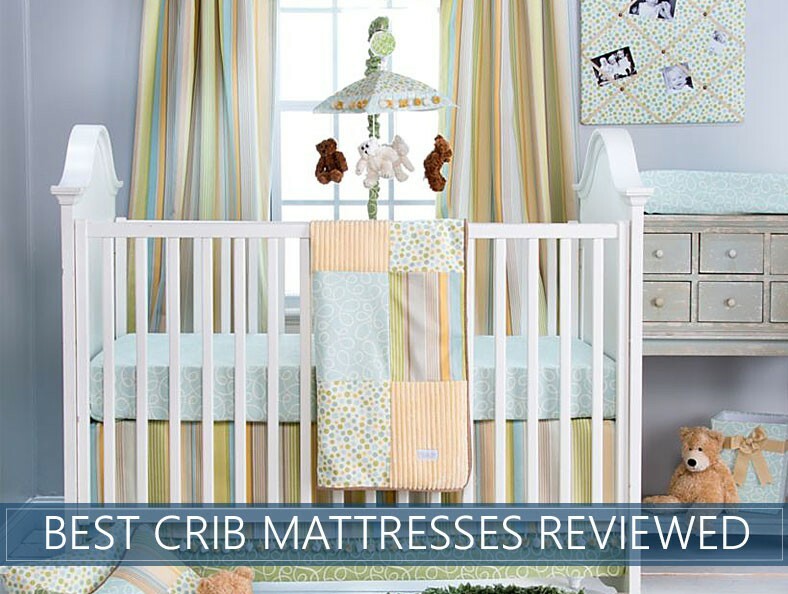 Crib mattresses must pass certain standard requirements in order to be sold on the market in the United States. First of all, there are safety standards which are defined by the U.S. Consumer Product Safety Commission and the American Society for Testing and Materials. The US Federal government has regulations for cot bed standard sizes under the Consumer Product Safety Improvement Act of 2008 (CPSIA). As far as the eco-friendly beds are concerned, there are many manufacturers who claim that their products are indeed friendly and safe for the environment. However, you should check if they have a certification called Oeko-Tex Standard 100. This is a globally accepted certification geared towards product safety with chemical and other stipulations. When it comes to buying a good baby cot mattress, you might not want to try bargain shopping, but you should also know that buying an overpriced one won’t do you any good. The price is normally a good indicator of quality, but there are other important aspects you should look into. According to numerous customers, a high-quality product will probably cost you between $90 and $350. Speaking of organic, they have a price tag somewhere between $80 and $400. These are some of the important factors that you should keep in mind, and we highlighted some of them in our guide with some of the best bed brands of 2019. Foam based products are the most lightweight of all. There are various types in terms of thickness, in the range between 3 and 6 inches. You should consider the firm because soft ones have proven to be a safety risk. A good thing about this type is that it's easy to check how it conforms to child’s head or if it will stay firm as it should be. Apply pressure in the center and on the edges and if it regains its position quickly, it’s good. Another characteristic you should look for is the foam density. You can assess it by seeing the weight difference between the models or by trying to put your palms together while having the mattress between your hands. If it has good density, you won't be able to squeeze it and touch your palms. Innerspring type is the most popular among parents because of their firmness and reliability. Generally, a customer’s logic is based on the fact that most of them are sleeping on innerspring mattresses as well. 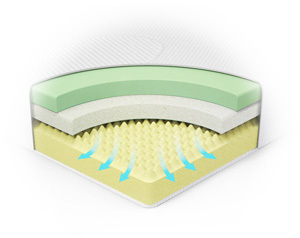 These mattresses provide support with coils which are placed in a specific pattern scheme. The price of these are usually higher than for the foam ones, but the cost varies depending on the model. They contain an insulator pad which is, among other parts, a crucial component to protect the baby from coils. It also weighs more because of their content, but they are more durable in the middle where the child usually sleeps. However, there are some flaws. They have a vinyl covering which tends to crack or tear over time. This type of mattresses can be made of cotton, wool, natural latex, etc. This kind is considered to be the safest because they don’t contain flame retardants, vinyl or polyurethane foam. Studies show that these chemicals release toxic gases which may harm your newborn. Other users suggest that non-organic latex may be a cause for allergies. 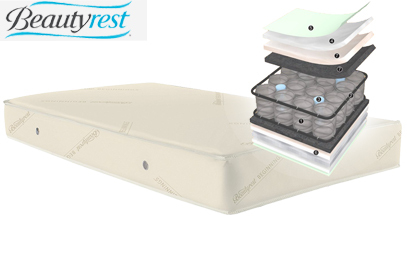 “Breathable” beddings are formed of materials which allow your baby to breathe even when your infant has her or his face pressed against the sleep surface. However, this matter hasn't been investigated thoroughly enough. Foam mattresses are made of polyurethane and consequently weighs less. This may be important when you lift it while changing your baby’s diapers. However, spring beds are the most popular choice due to their firmness, and there is less worry if regaring the amount of chemicals. As far as the price is concerned, they are almost the same. For a price tag between $90 and $250, you can get a good product. The size is regulated by law so there shouldn't be many differences there. Although there are a few distinctions between these two, both are considered to be equally good, and you should decide which one to choose depending on your preferences. Whichever you prefer, make sure that they are firm enough and pick the model which will be the safest for your newborn child or a toddler. Organic cot mattresses are becoming globally popular because they are mainly focused on keeping your child safe from various hazardous materials. Although this topic hasn't been researched to its fullest, people who are pro-organic consider that non-organic products put your child in jeopardy and contain materials such as polyester fabric, vinyl or petrochemical foams. These materials can cause respiratory allergies, or have a bad influence on your child. One of the main aspects which made us choose Heavenly Dreams White Crib was its resilience. Because you’ll be placing an infant inside the crib, the mattress will often have stains and odor which won’t stay there for long. It has remarkable venting alongside with a waterproof cover on it. Leaking diapers aren't an issue anymore. It’s firm and stable and may be a wonderful choice for your infant. It has high-density and high-quality memory foam which will bring your child comfort all night long. One minor issue of this bed for some is that there are no springs inside it. However, the bed is so firm that you won’t know this until you check the characteristics. The manufacturer managed to make a firm, springless bed for infants. 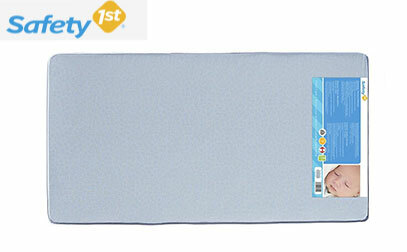 A dual mattress which means it has a side for a newborn child and another one for a toddler. It may be considered an ideal cot bed for a newborn child because firmness and comfort are its primary qualities. Another trait is that it has no chemical smell which may cause allergic reactions to a newborn or sensitive child. It is a bit heavy which proves that it’s stable and firm. The manufacturers also made sure that the venting was in order. There are 2 vents on each side. It is priced a bit higher, but just the aspect of dual firmness is something which points to you being able to use this product for years. If you want your newborn child to have firm and secure support, this may be the right choice for you. 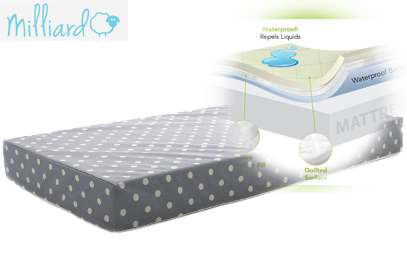 One of the main features is that it's covered with a waterproof coating which ensures that your child wetting the bed won’t leave a long-lasting effect on it. Our research indicates that babies generally tend to fall asleep quickly and wake up rather fresh. What better recommendation could you ask for? Compactness and the comfort this product has to offer are its highest qualities. This crib side, however, doesn't respond so well to the pressure of a child jumping on it; it’s not advisable to use it as a trampoline. This being the only flaw we can find, this mattress makes it a good place for an infant to sleep. Cozy Soft Portable Crib from Kolcraft is a solid choice for tummy sleepers. The main concern here is support. When your child sleeps on its stomach, the pressure builds up in their body which can consequently bring back pain and discomfort. This mattress has a firmness just the way tummy sleepers need it. Not very firm, but not soft at the same time. This above medium level of firmness should release your child from the risk of back pain. It doesn't have coils, but a thick layer of memory foam does the trick and should be very comfortable. This bed may be too soft for newborns, which is something to note. 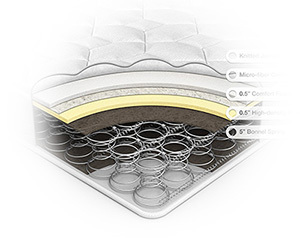 The memory foam construction is just the right firmness to provide optimal comfort. It is a perfect fit for the standard crib, and it doesn't leave any space on the edges. CertiPUR certification is a guarantee of the safety of materials in the bed to that standard; also, this bed shouldn’t lose its shape even after years of use. For safety precautions, no harmful flame retardants are present. A growing issue nowadays is the Flat Head Syndrome which is caused by inadequate support for the baby’s head. If you need a bed that can improve your child’s head shape, you might want to pick this one. Many parents are turning to products with alternative materials, and for a good reason. 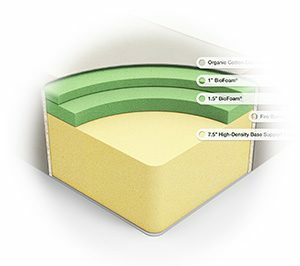 Sealy Soybean Foam-Core is the one fantastic option when it comes to renewable and natural resources incorporated into baby mattresses. 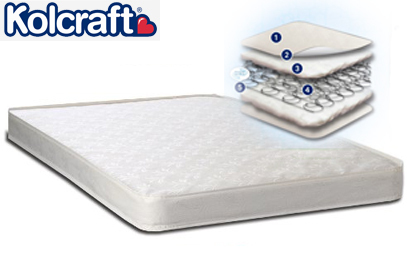 One of the main traits of this mattress is that it is very firm and lightweight at the same time. The secret is that it is made out of soybean oils provided directly by the US farmers. Another important aspect is that it is waterproof and has a stain resistant cover which makes it very practical. On top of all that, it has a Greenguard certificate for ensuring that the baby’s environment is healthy and a safe space. 1. 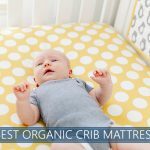 Which organic crib mattress is best? First of all, you must define the term organic because you’ll find a lot of incorrect labeling. You must make sure that it doesn't have materials such as vinyl covering, which is not within this label. Among other things you should look for in an organic bed is the an organic certification label. Many mattresses have polyurethane foam in them, so they will not get that label. However, many poly beds can obtain a CertiPUR-US certification for chemicals. For the product to be called organic, all fibers used for making it must be natural. Read all the labels thoroughly and ensure that everything is genuine because the manufacturer’s instructions can be very deceiving and confusing. If you'd like to learn more we recommend reading our full organic crib guide. 2. Are crib and toddler mattress the same size? The short answer to this question is yes. Infant mattresses usually have dual firmness. One side for a newborn and one for a toddler, depending on the firmness. 3. When to move cot mattress down? This question doesn't have an exact answer. The general opinion is that it should be done when the baby is from six to nine months old. Some parents drop the bedding when the kid learns to stand up by himself. Others rely on their feeling and move the cot mattress when they feel their kid has grown enough for it. 4. What is a baby bed mattress pad cover? A base pad, topper or an underpad is a material, mostly made from foam, which is meant to be placed on top of the bedding. Its purpose is to provide comfort and a warm feeling. This may be useful if you don’t have money for a new product but it’s not generally a worthwhile solution. Another use for these pads is a ‘safety waterproof layer’ between your mattress and leaking diapers. They have 100% waterproof absorbency in order to keep your baby safe and dry. These covers often have a venting system to enable airflow. Some of the best types of pads are viscoelastic foam toppers, memory foam toppers, and electric pads. 5. How thick should be a mattress for a newborn? The thickness or the depth of standard cribs are regulated by US laws. It shouldn’t be thicker than 6 inches top to bottom when it’s laid out flat. Obviously, buying a kids mattress isn't the easiest task, and this review has tried to bring all the things you should consider closer to you. Although it may look like a simple review, hours and hours are put into research to find the products with best features. While there is an abundance of cheap, used up crib mattresses on the market, you should think whether you want your child to have a safe mattress. You should always do your research, and you can find products that stay within your budget, but keep in mind that quality is very important. We hope this review has helped you and we wish you and your children a good night’s sleep. Just curious, has anyone tried Heavenly Dreams White? I’m thinking about buying one this week. Hope it’s not too soft.